Anytime I am somewhere where there is party food, I gravitate to the dips. I can't help myself. Warm or cold, I can never get enough, however the warm dips slay me! You don't just sit around on a Tuesday night and say to yourself...I think I will whip up an ooey-gooey-delicious dip...do you?? Nope. Thinking about that and wanting to put a twist on it for those not into the whole buffalo sauce thing (gasp!!). I made this Cheesy Chicken Taco Dip. It's easy, foolproof, easily transportable and I just know it will be a crowd-pleaser! And yes...I made this on a weeknight the first time, you know...since it's my work I can get away with that, lol! My husband walked in the door from work and I was like, honey...Taste this. He did, then he did again and he was like Geez Col, THIS is really good...really good! My son Connor (15) ate about half of it (and he is new to the whole dip scene). I didn't have any store-bought chips on hand when I made this so I cut tortilla's into chips, gave them the lightest brush of oil, seasoned them with some salt and baked them at 375 for about 7-8 minutes. Just until crisp. Feel free to dip away with your favorite chip...or be like Connor and use a chip in one hand and a spoon in the other! 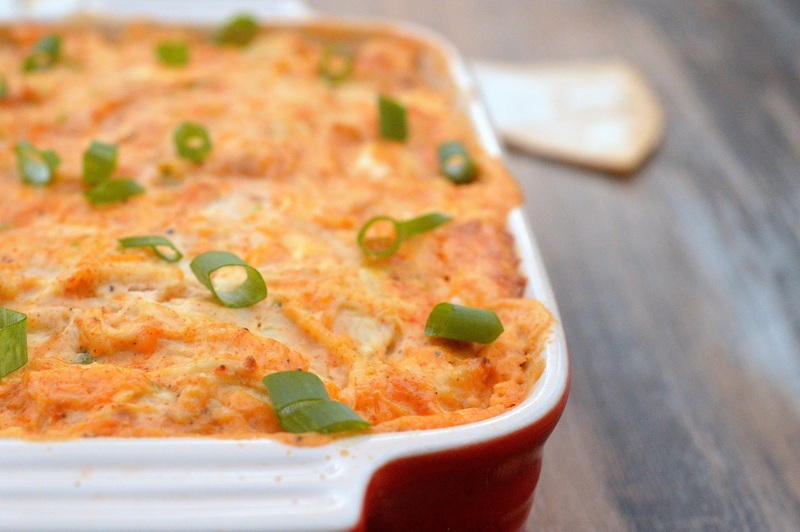 This Cheesy Chicken Taco Dip is sure to be a hit wherever you take it. I would transport it uncooked and cook it on site. I am not a crock-pot-kinda-cook, so I can't advise you in that but I can't see why this wouldn't work in one of those. I will say to stick with full-fat cream cheese and sour cream. If you are going to do it...DO IT. Plus they tend to break down a bit in dips. -In a mixing bowl, combine cream cheese, sour cream, jalapeno and taco seasoning and mix until blended. -Add in chicken, cheese S & P and toss until combined. -Scoop into a small baking dish and cook for 20 minutes or until bubbly around the edges and a bit browned on top. 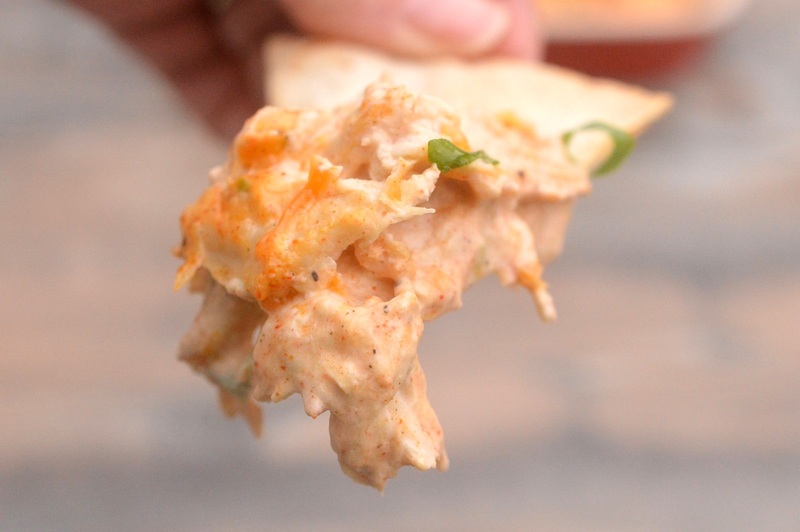 The post Cheesy Chicken Taco Dip appeared first on Souffle Bombay.